Here’s how John does it. 1. Build a blog around a topic you’re passionate about, and find products/services related to your topic. Your blog’s goal will be to draw readers in by providing them great content built around a specific topic. As you find your topic, he suggests identifying products or services that compliment the topic of your blog, and become an affiliate for those products/services. If you’re unfamiliar with this term, think of it as becoming a commission-only sales rep for the products/services these companies sell. Most companies offer an easy way for you to become an affiliate, which means that if anyone buys one of these products after having clicked on your blog, you’ll get paid. This idea is what forms the heart of the “back end” system. 2. Refine your blog with the goal of capturing a reader’s email address. 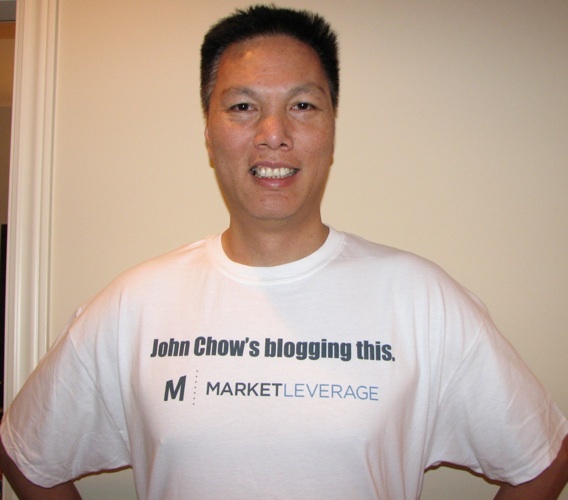 John’s goal is to capture an email address, as that’s what he uses to dialogue with his readers on an ongoing basis. He claims to have 25,000 email subscribers, and acquires them at a pace of around 100 per day. As with all marketing, one of the best ways to get what you want is to provide an offer. John suggests giving something away, like a free e-book. It may take you some time to create an e-book or find something to give away, but it certainly impacts conversion rates. 3. Once you have the email address, build a relationship with the person. While carefully following the CAN-SPAM laws, John suggests creating a series of emails that are sent daily or weekly. John describes his schedule for sending emails (one per week), with the goal of each email being to build trust and establish you as an authority in your niche. Your goal at this step is to become a trusted resource. 4. Put the contact through a series of drip emails (also known as a sales funnel). Through the sales funnel, you’re suggesting products and services related to the topic of your blog. This is what we covered in Step 1 (above). Suggesting products to readers (as an affiliate) is what forms the basis for two-thirds of John’s revenue. In the video, John describes how he does this for the topic of his blog. 5. Figure out your cost per lead (or sale), and find other ways to pay for traffic that generates a positive return on investment. Once you’ve established some traffic and corresponding sales, you’ll have an idea of what it costs to generate activity. Once you know this number, you can find other ways of driving traffic, and provided that these avenues are at (or ideally, below) your cost per lead or sale, you’ll generate a positive ROI. That’s the basis for the $500k blogging model. Each of these steps requires some tools, services, and know-how, but they’re certainly all within reach of anyone willing to put in the time. I do not believe in get-rich quick schemes. I am of the belief that it takes hard work and tenacity to make sh*t happen. However, I also believe that the things most people feel are too difficult (or in some cases impossible), present an opportunity for someone willing to put in the time and effort. I suggest the same is true for making money with a blog; it’s really just like any other business. If you have some time [56 minutes], it is worth watching John’s video. There are more lessons to be learned. What do you think? Do the principles make sense? If you disagree, why? If you’ve ever thought about making money with your blog, what’s holding you back?